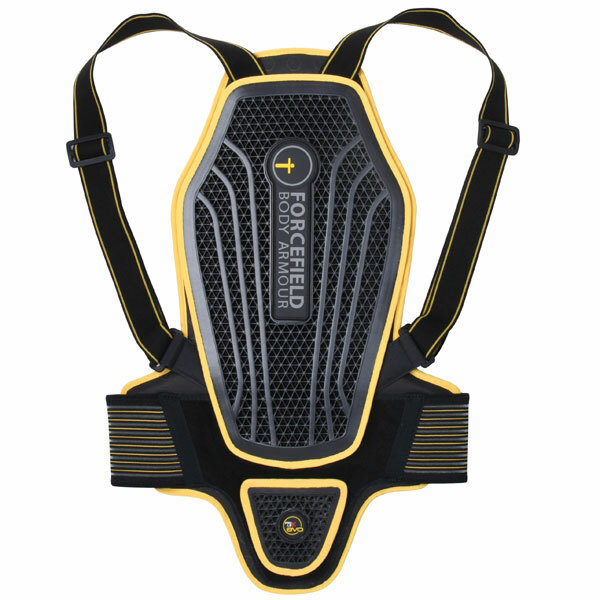 Using Nitrex® a unique high tech triangular shock absorbing material combined with dense and light weight layers of foam the Forcefield Sport Lite 2 back protector is designed to be soft, flexible and comfortable whilst still providing maximum impact protection. Nitrex® also provides Repeat Performance Technology (RPT) to ensure that even after multiple impacts there is no loss of protective performance. Constructed with a removable and washable outer cover to enable the Sport Lite 2 to be kept clean and hygienic it also makes the protector more flexible as it is not bonded at the edges increasing comfort in use. Fully adjustable shoulder straps and double waist adjustment ensure a correct and comfortable fit for different body shapes. Sleek, slim, low profile (only 22.5mm) breathable back protector. Constructed using Kevlar® thread for increased strength and durability. Made with NitrexEvo® a unique high-tech triangular shock absorbing material that’s soft, flexible and comfortable whilst still providing maximum impact protection. Exceeds the CE test EN1621-2 (Level 2) the highest possible level. Multiple layers are stitched and perforated to allow partial movement of the inner layers. Anatomically and ergonomically designed with 3d mold-ability. Fully adjustable shoulder straps and double waist adjustment. Men’s and ladies versions are offered.